On Tuesday the 16th of December 2014 the European Commission announced its work plan for 2015. This College of Commissioners has only been in office since the start of November, and given President Jean-Claude Juncker’s stated aim of being bigger on big things and smaller on small things, this was seen as a good opportunity for them to review and downscale European Commission legislation. First Vice-President Frans Timmermans, in charge of “better regulation”, reviewed 452 pending pieces of legislation left over from the previous Barroso II Commission; less than 50 will survive in their current form. 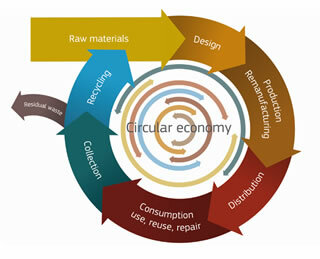 The Circular Economy. Photo Credit: European Commission DG Envi. 80 per cent recycling target for packaging, such as glass, paper, metal and plastic by 2030.
ban on landfilling of all recyclable (plastics, paper, metals and glass) and biodegradable waste by 2025. There are several other aspirational goals, and a few specific proposals on end-of-life vehicles, batteries and electrical equipment. Admittedly, the details may not seem exciting. But the change in attitude entailed in the policy is crucial. On the one hand, the linear economy is based on the arrogant view that we are in charge of the earth and thus we can use and dispose of its resources as we wish. A circular economy, on the other hand, is based on the recognition of the finite nature of the Earth and its resources, as well as the limits of our power over them. Fundamentally it seeks to reform our economy to be more akin to the natural world,1 and less comparable to a leech, siphoning off materials for our own benefit to the detriment of our host. As well as benefiting the planet, the Circular Economy package would boost the economy. The European Commission impact assessment estimated that the package would generate net savings of €600 billion and create hundreds of thousands of jobs. Estimates suggest that a resource productivity (calculated by dividing GDP by raw material consumption) gain of 30 per cent would create two million jobs. These jobs could play a considerable role in softening the impact of job losses due to the energy transition. So far, so good. So why scrap the proposal? Timmermans explained that the package was to be withdrawn and re-tabled in early 2015 with “a broader, more ambitious approach.” He also said, rather enigmatically, that they wanted to approach the issue “in a circular way and not just half a way.” Environment Commissioner Karmenu Vella has insisted that the intention is not to weaken the proposal. These assurances may create the impression that this change will not be catastrophic. However, the lack of detail about the proposed changes and Timmermans’s tendency towards deregulation should worry those concerned for the environment. 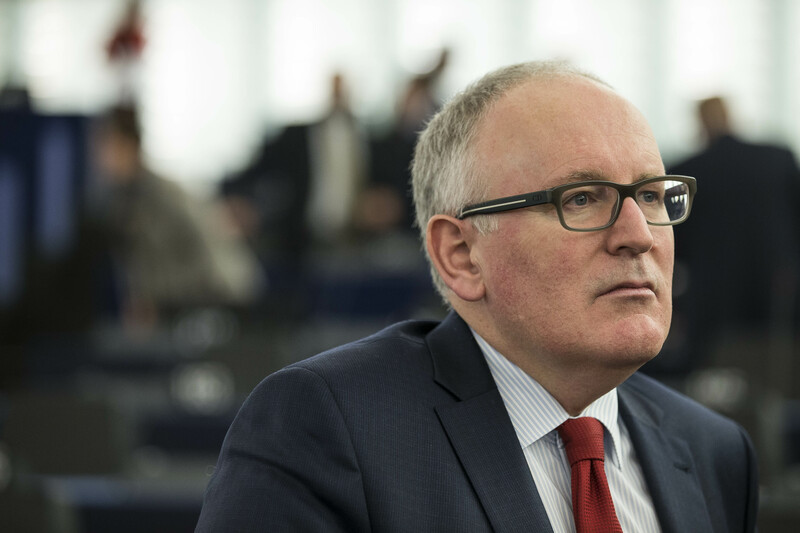 Timmermans’s brief includes sustainable development, suggesting he is responsible for increasing the sustainability of our economy and society. Despite this, he seems to be placing rather more emphasis on “better regulation”, which he seems to interpret as “less regulation” particularly regarding environmental and social protection. Fears that the new Commission’s emphasis on growth and jobs could mean the subordination of social and environmental concerns are being realised. One particular source of concern is that this decision follows the leak of a letter to Frans Timmermans from influential lobby group Business Europe. Their letter advanced a list of regulations (all relating to environmental protection or workers’ rights) to be abandoned. The letter argued that the circular economy package should be withdrawn and re-tabled as an exclusively economic piece of legislation, taking into account the “wider economic interest”. Leaving aside what that actually means, the similarity between what Business Europe advocated and what Timmermans has done is striking. QCEA believes that this is entirely the wrong approach: environment and economics should not be pitted against each other. Rather they should be drawn together. Ironically, Business Europe criticises the greatest value of the package; that it works at the juncture between environment and economy. This is essential to make the economy more environmentally friendly, and for us to have a sustainable future. Arguments like that of Business Europe only serve to reinforce the perceived opposition between environment and economy, and to make it more likely that businesses will continue to ride roughshod over the planet. It is important to stress that this is not an entirely black and white case. The package is not perfect (in a truly circular economy, recycling is the last option), and we cannot truly know Timmermans’s motives. However, given the context it is only sensible that we are cautious, and work to protect the package, certainly until we know what might be replacing it. The decision to scrap it and re-table a new policy does not convince; it would surely be possible to improve the package without withdrawing it entirely. QCEA will continue to work on this issue, aiming to publish a briefing paper on the necessary elements of an ideal Circular Economy package early in the new year. QCEA has written a model letter to send to Frans Timmermans, Karmenu Vella and Jean-Claude Juncker asking them not to withdraw and retable the Circular Economy package, but to improve it in the public eye. You can download it as an open document file here, and as a pdf here. To sign up for QCEA’s action alerts, write to Gordon at office@qcea.org, giving your name and countries of citizenship and residence as well as your e-mail address. This post was updated on the 28/01/2015 to include reference and links to QCEA’s model letter.